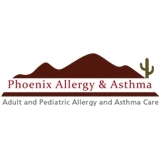 Phoenix Allergy & Asthma (Phoenix) - Book Appointment Online! Phoenix Allergy & Asthma is an allergy clinic dedicated to providing the most up-to-date treatment for adult and pediatric patients suffering from allergies or asthma. Michael Saavedra, MD is Board Certified in Allergy & Immunology and provides comprehensive allergy and asthma treatment for patients that suffer from seasonal or perennial allergies. At Phoenix Allergy & Asthma we pride ourselves on providing compassionate and efficient allergy and asthma care for professionals and busy families, and we will make every effort to maximize your time with Dr. Saavedra, answer all of your questions, and minimize waiting time. We are conveniently located on 44st and Camelback Rd. in Phoenix and are easily accessible from Paradise Valley, Scottsdale and Tempe.